The NHLPA's Goals & Dreams fund, which since its inception in 1999 has helped grassroots hockey programs in 25 countries around the world , recently made another special trip, travelling to Canada's most northern territory to deliver 18 sets of new hockey gear to the children the community of Pond Inlet, Nunavut. 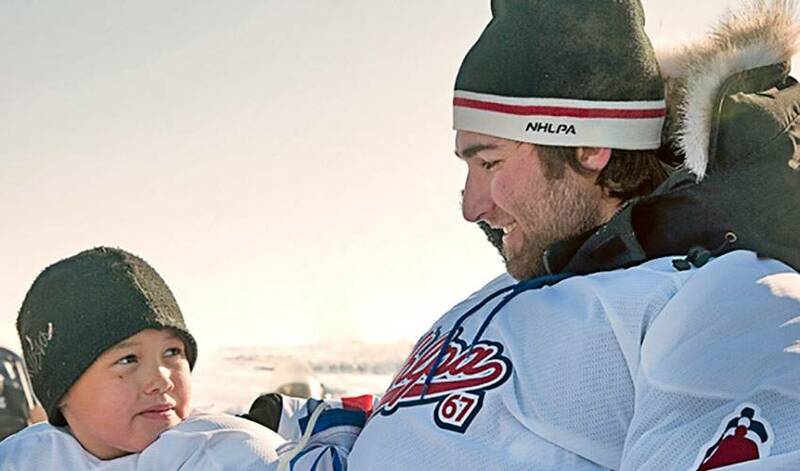 Kyle Quincey, defenceman for the Colorado Avalanche, and Matt Langen, manager of the Goals & Dreams fund, represented the NHLPA on the trip, joining supporters from Project North, which is a group that focuses on improving the lives of children in the Canadian North. Together, the group stayed for three days in Pond Inlet r an experience that neither they, nor the town, will soon forget. Pond Inlet is a small, remote community in Nunavut with a population of around 1,400. While it has very beautiful, untouched landscapes, its geography poses unique and significant issues for people and goods attempting to arrive or leave by plane or by ship. For the most part, food and other basic goods are shipped in from provinces and cities in the south, with the result being a difficult in acquiring many things and extremely high prices for items that are available. This principle applies to hockey equipment, which, even in the populated areas of the country, is becoming more and more expensive every year. This results in a scarcity of quality and modern equipment , despite a true love for the sport amongst the community. The members of the group spoke frequently of how much hockey means to the community; from joining kids for an impromptu game street hockey on their first night in Nunavut, to how the local children constantly brave the elements to play and share the equipment that they do have with every member of the community. In a region where basic survival is something that is not taken for granted, hockey serves as a welcome distraction and an outlet for both kids and adults. Michelle Valberg, the founder of Project North, began the programas a way to help the young people of the region positively enrich their lives through sport and physical activity. Valberg has made 17 trips to Canada's North in different capacities, and will remember this one as accomplishing one of the original goals she had when she created the program. Quincey, who spoke in glowing terms of the trip and the people he met along the way, seemed to have come away enlightened in the same way Valberg described after he first trip. In a league that continues to get younger, veteran centre Carl Soderberg keeps improving with age. Nathan MacKinnon led the league with seven points, alongside Colorado Avalanche captain Gabriel Landeskog, while building his season-opening point streak to eight games.